Beautiful 3BR, 3.5 BA home in Springhurst. Front foyer opens to the two-story Great Room. You will love the hardwood floor, & fireplace. The Kitchen boasts hardwood floors, granite counters, stainless steel appliances, double sink, and fresh white cabinets. The dining area features views of the back yard. The spacious Diningroom has vaulted ceiling and chair rail. 1st floor Master has spa-like MA Bath w/ Jacuzzi tub, shower, dressing vanity, & double sink. 1st floor 1/2 Bath & Laundry. 2nd floor w/ 2 Bedrooms & Full Bath. Basement Family Rm w/ built in book shelves, recessed lighting, & bar area. Basement also includes a Full Bath, additional room (potential play or office area), & storage space. 2 car garage. Tranquil back deck & patio overlooking nature preserve beyond. 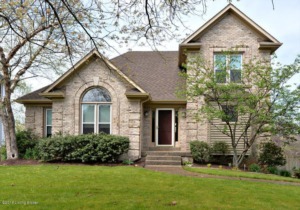 Sought after neighborhood w/ clubhouse, pool, & tennis court. Numerous updates attached! Click to schedule your showing.